chance for high wind gusts and other potentially damaging weather occurrences. take steps to prepare for winter. 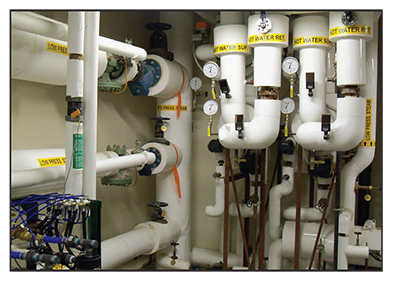 building, in turn, has its own mechanical room and steam distribution system. sidebar on the IEAP on page 8). this is the ideal scenario, it is often not the case. damaged, or the codes have changed, the building may no longer be compliant. labor cost, and insulation material cost for the proposed work. repeat the cycle once again for winter. Certification Corporation—will become Certified Insulation Energy Appraisers. competitive edge and help grow their business. more information, visit www.insulation.org/training or email training@insulation.org. 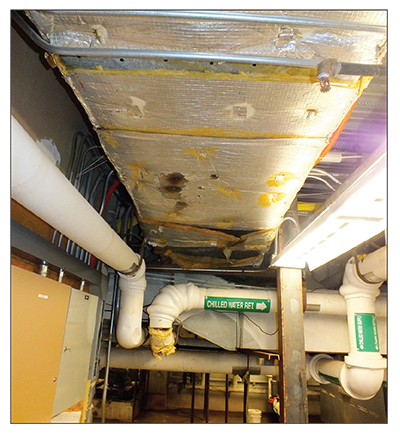 As this photo shows, some of the duct wrap insulation on the underside of this duct has become damaged and/or detached from the duct. This insulation should either be repaired or replaced in preparation for the winter heating season. 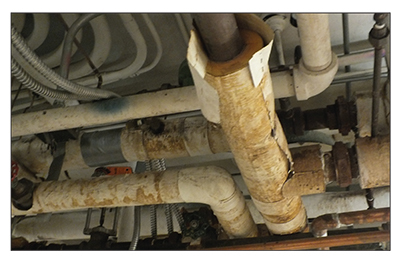 In this application, some pipe insulation is missing and needs to be replaced before firing up the boilers for winter. Some of the remaining pipe insulation clearly needs to be either replaced or repaired. Replacement with new material may be quicker and easier than trying to repair the old insulation. Most insulation professionals have seen pipe insulation damaged by foot traffic. These pipes are located close to ground level and have a high likelihood of being stepped on, resulting in damaged insulation. This damaged insulation should be replaced by new material before firing the boilers for the winter. It some cases, it may be prudent to use a hard, high–compressive strength insulation that can better withstand foot–traffic abuse. 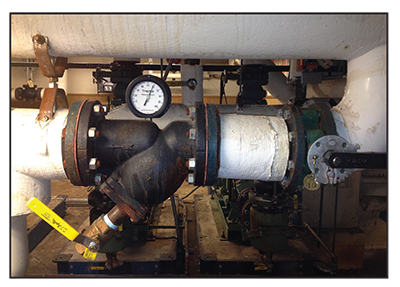 This bare gate valve in a steam tunnel at a university results in excessive heat loss and high air temperatures in the tunnels. It should be insulated with either conventional insulation or with a removable/reusable insulation blanket as part of the process of preparing campus buildings for winter. 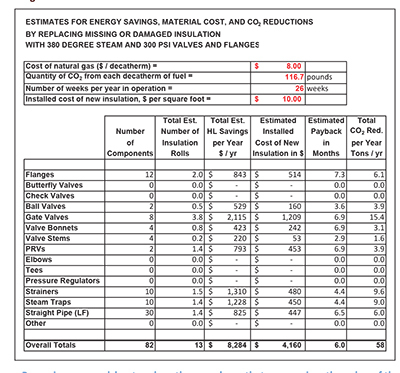 Preparing a spreadsheet such as the one above that summarizes the value of the energy savings, the simple payback, and the annual tons of greenhouse gas emissions reduction will help a facilities department get funding for their insulation project. With a simple payback of only 6 months (typical for a steam heating system with 380°F steam), the case for doing this maintenance work on the pipe insulation is compelling. (Note: 3E Plus® was used to calculate the heat flux values, not shown on this summary table). On components such as this pressure regulator on a steam pipe, it may be prudent to use a removable/reusable insulation blanket. Mechanics may have removed this blanket assembly to perform necessary maintenance. However, it must be reinstalled by a skilled, knowledgeable insulator for it to insulate properly. Autumn is the best time to accomplish this. 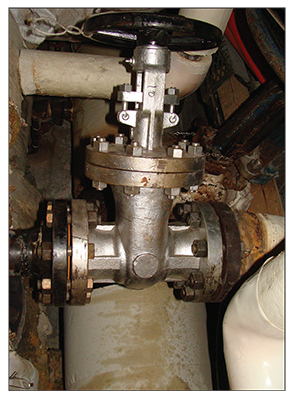 This strainer and its connecting flanges should be insulated, and this work should be accomplished prior to the start of the heating season. Likewise, the butterfly valve to its right should be insulated. Leaving these 2 components bare will result in significant energy waste during the heating season and will contribute to a high–temperature boiler or mechanical room. 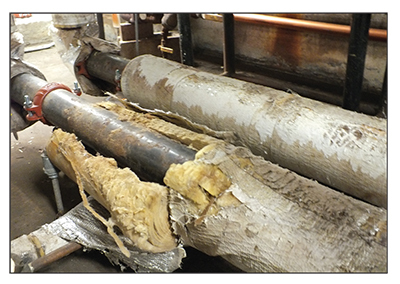 Every repaired pipe insulation project is not necessarily going to look this good. 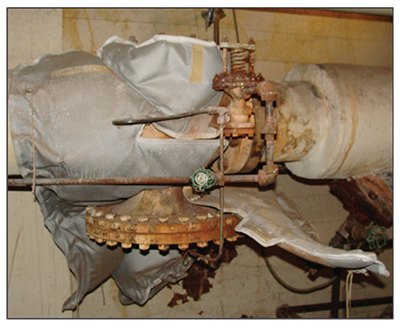 In this application, the strainer should be insulated, perhaps with removable/reusable insulation blankets, as well as portions of the 2 steam pressure regulators. It would also be beneficial to insulate the gate valve bonnets and steps, since those result in exposure of considerable amounts of bare steel that lose a great deal of heat.